Rabbi Sholom Galperin grew up in a small South African coastal town called East London. Shortly after his Bar Mitzvah he relocated to North America. His formal Yeshiva education spanned through Chicago, Montreal, Florida, New Jersey and Sydney Australia. He received his Rabbinical ordination from the Rabbinical college of Australia and from the central Rabbinical court of Israel. Well known for his dynamic personality, he spent 8 years leading services, educational seminars, and community outreach and youth programs in Silicon Valley CA, Cincinnati OH, Miami FL, Long Island NY and Sydney Australia. Since 2009, Rabbi Galperin has been the spiritual leader of Congregation Shaarey Zedek in Windsor, Ontario. Rivka grew up in Amstelveen The Netherlands where her parents were the first Chabad representatives. Her passion has always been to inspire people. This passion is embedded in every fiber of her being since childhood. After graduating with distinctions from the Cheder for girls in Holland, she received her diploma in education from the Beth Rivka Seminary in France. She then spent 2 years teaching and directing numerous youth programs in Geneva Switzerland and California. Through her clever form of sharing the joys and depth of Judaism, Rivka has the ability to make everyone feel welcome and at home. Together, the Galperins form a powerful team, bringing warmth and happiness to the families, students, friends and community around them. 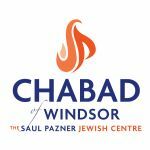 With their warm non-judgmental approach, they have been successful in creating the most vibrant community for the Student’s of the University of Windsor and Windsor's Jewish Community.